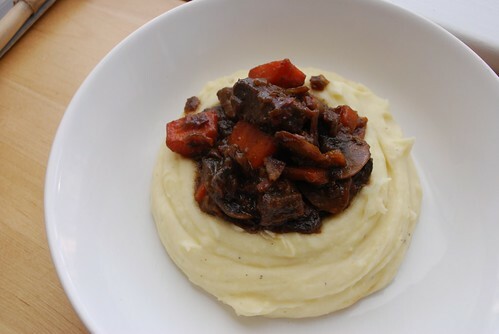 So I watched Julie & Julia the other day (I know I’m a bit late to the party) and Julia Child’s Bouef Bourguignon is elevated to some kind of magical cult status in that movie. It will ease your worries! Soothe your soul! Impress your friends, relatives, and newspaper columnists!!!! So I kind of figured, geez. If this one dish can single handedly transform my life, why WOULDN’T I want to make it? And immediately, if not sooner. I found the recipe online and began my Saturday morning trek for the ingredients. I live across from a Whole Foods so most of the ingredients were not difficult to find, but I forced myself to venture to Trader Joe’s for the wine. I’m a “starving” grad student, and Boston liquor stores are a total effing ripoff for wine. I regularly find bottles of wine I would pay $5 for in a grocery store in California being peddled for $8-10 at your friendly neighborhood liquor store. Boo. TJs it was. I gathered my ingredients. Beef, bacon, veggies, wine, broth, flour, seasonings. I looked at the instructions. SO MANY STEPS. I decide to take it slow, one step at a time. Don’t overwhelm yourself, Steffany! You’re going to do this right! If Julia Child tells you to cook the mushrooms separately, you will cook them separately goddammit! You will remove the bacon to a plate before you cook the beef! None of your laziness! I had actual homework to do that day. 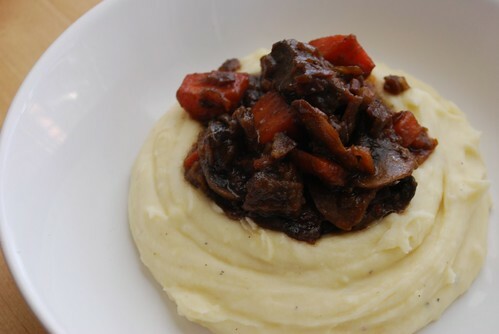 Instead, I made bouef bourguignon. Now, to be fair, it tastes different from any beef stew I have ever tasted. 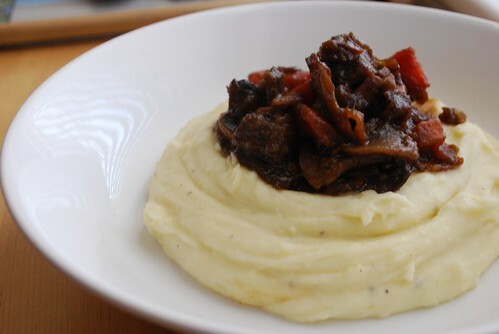 It is meant to go over boiled potatoes or rice or pasta, so it kind of has more of a ragu-like texture and is not particularly soup-y. I think it is worth trying, just be prepared to lose your day to it! 3 C red wine, NOT cooking wine. In fact, you should never buy cooking wine. Only use a wine you would drink in your cooking. If you wouldn’t drink it, why in god’s name would you bother eating it?? 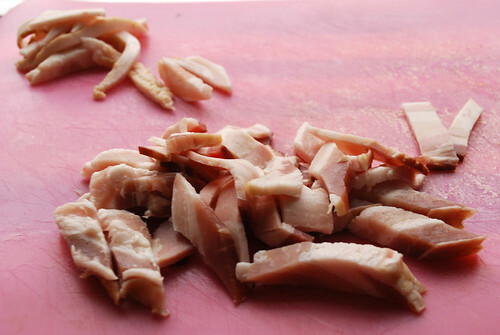 Remove the rind from the bacon a cut it into sticks 1/4″ thick and 1.5″ long. I used bacon slices. Simmer in a pot of water for 10 minutes, drain and dry. Heat your oven to 450˚. Saute the bacon in 1TB of olive oil for about 10 minutes, or until lightly browned. Remove to a side dish with a slotted spoon. Conserve the oil, that is what you will be browning the beef in. Cut the stewing beef into 2″ pieces. Mine are probably more like 1″, but I wanted to trick myself into thinking there was more meat than there actually was. I do this a lot…! 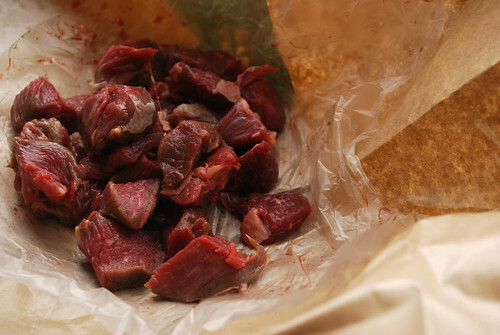 Dry the beef in paper towels in order to ensure that it browns. Heat the oil until it is nearly smoking. Saute the beef in the oil a few pieces at a time until it is nicely browned on all sides. Add to the plate with the bacon. 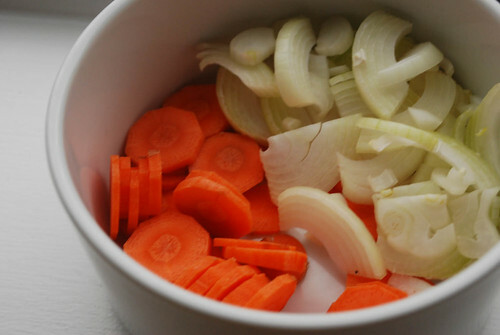 Saute the carrot and onion in the same oil until they are browned. Pour out any excess cooking fat, then return the beef and bacon to the pot with the veggies. Add the salt, pepper and flour and toss to combine. Set the casserole uncovered into the preheated oven for 4 minutes. Take the casserole out and stir the ingredients, then return to the oven for 4 minutes more. Remove and reduce heat to 325˚. Stir in the wine and stock so that the meat is just covered. Add the tomato paste, garlic and herbs. Bring to a simmer, then cover, take off the heat, and put in the oven. Allow to cook in the oven for 2.5 – 3 hours. 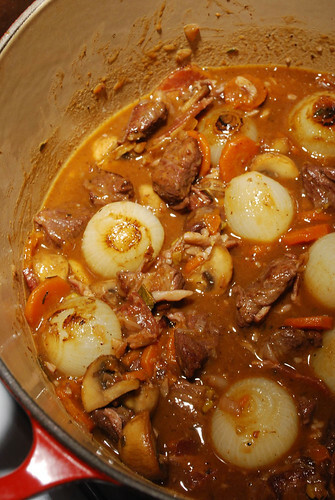 Try to regulate the heat so that the stew is at a gentle simmer the entire time. While the beef is cooking, prepare the onions and the mushrooms. Slice the mushrooms into quarters and saute in butter (I used 1 TB for 1/4lb of mushrooms). You may not want to use all that butter, which is fine by me. You can always use olive oil instead, or an olive oil/butter mix. 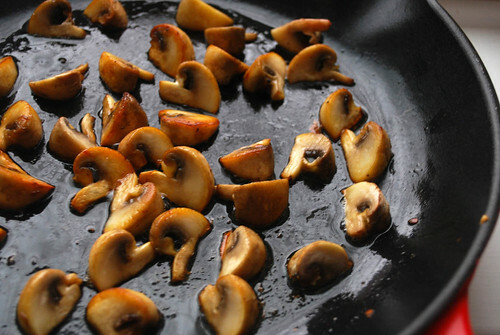 Mushrooms sauteed in butter are really, really good though! Maybe just this once, eh? Saute until they are browned and delicious looking. Set them aside until the meat is done. You’re basically going to do the same thing with the onions. Mrs. Child says to brown-braise them in stock, but I the recipe I downloaded from some website didn’t have the page with those specific instructions on it. So I made it up, but it seems pretty authentic to me! Peel your onions and leave them whole. Saute them with butter and when they are starting to look a little brown, add some beef stock (I used 1/2 C stock for 9 pearl onions). Cover and cook for 5 minutes. 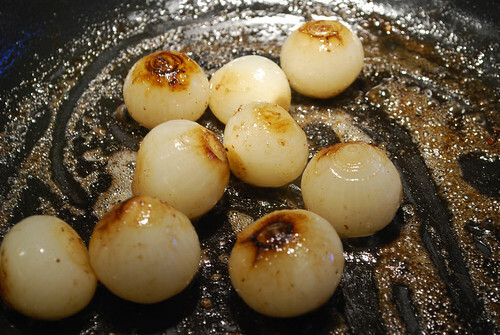 Then uncover and swirl the onions around so they get a nice deep brown color on their edges. Keep them aside with the mushrooms until the meat is ready. This is when the recipe gets to the crazy part that I hate. The recipe says that, once the meat is done, to pour the contents into a sieve set over a saucepan. Mmkay. 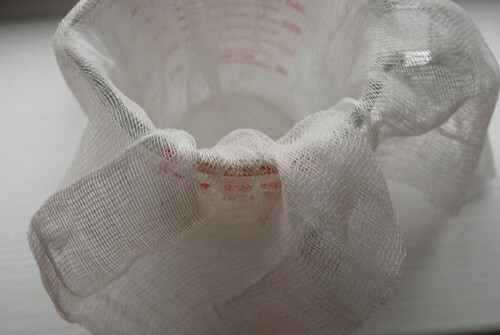 I used cheesecloth. That was a bad idea. Should you choose to follow this step, use a colander. So you pour the meats into the colander/sieve/cheesecloth, separating the liquid from the meat. The liquid should all be in the saucepan. Wash out the casserole dish and return the bacon and beef to it. Add the mushrooms and the pearl onions. Return to the liquid, and simmer for a minute or two, skimming the fat off of the surface (I saw no fat. Maybe you will). You should have about 2.5 C of sauce thick enough to coat a spoon. If it is too thick, add some beef broth. If it is too thin, boil it down some. Pour the sauce over the meat and veggies. You are supposed to serve it over some boiled potatoes or, failing that, some rice or some buttered noodles. I was starving so I ate it with buttered bread. Good luck and godspeed, my friends!